Amidst all the news and busyness of recent events, I actually saw Chiba (my local prefecture) shown on the news for the first time last night, after a week of watching the aftermath in Tohoku and the nuclear crisis in Fukushima. 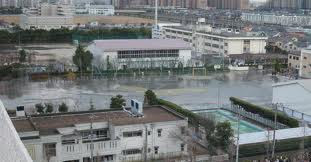 Chiba`s biggest problem at the moment is not damage from tsunamis, which pummeled towns in the east after the barrage of earthquakes along the pacific plate, but "land liquification." 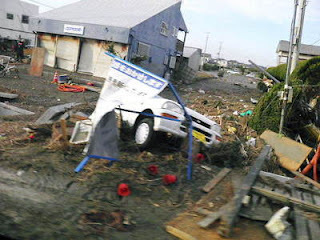 A lot of land in Japan, particularly near Tokyo bay and other coastal areas is artificial. 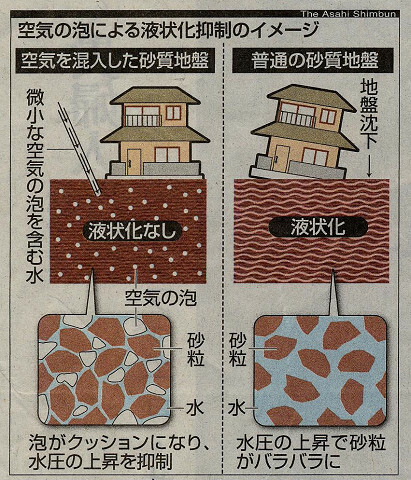 And these areas of artificial land react to large earthquakes by turning to liquid and that as you can see by the pictures below causes a number of structural problems for those cities, as well as poses a very real danger to those living in affected areas. 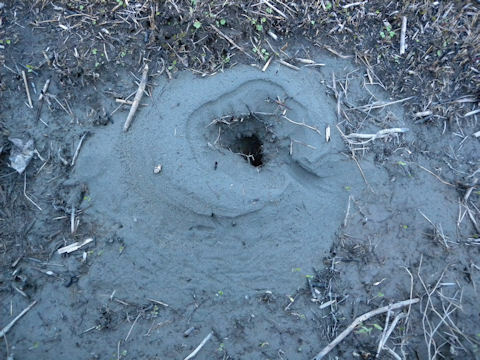 The ground is literally sinking beneath their own feet, homes, roads, power lines are slowly sinking into the earth with each aftershock or subsequent earthquake. The once prestine beautiful bay area has turned into a swamp overnight. A school in the city of Urayasu flooded from water seeping up through the ground. 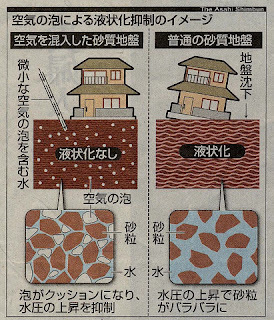 A short translation: Normal land has air bubbles that act as a cushion and protect from rising water pressure. Liquified land has only sand and not enough air in it to maintain its integrity. ﻿﻿This liquification phenomenon is the great risk of building on artificial land. Many of course who chose to live in these areas understood the risks, but it is difficult to watch as entire communities sink slowly into what used to be ocean over 30 years ago. In contrast to these cities along Tokyo Bay, the inland areas of Chiba have sustained little infrastructural damage. 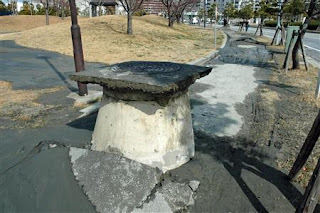 Prominenet cities like Urayasu and Ichikawa that boast high populations are struggling to deal with these problems at the moment. Most of the extremely liquified areas are nearly inaccessible to the public at the moment, while some areas are now beginnning to allow traffic and people back in. Will be posting more information as I am able, the aftershocks have died down quite a bit the last few days, but I just felt one as I typed this sentence. that is a scary thing..people have to take care. glad to hear you back here..
We appreciate the updates, Stephen, and pray for your safety and well-being. Glad you are safe. This is very good information you are sharing with us, about the ongoing crisis, and what, you have to deal with, being there. Thanks! Happy that u r OK.. This was really informative...and also really sad! 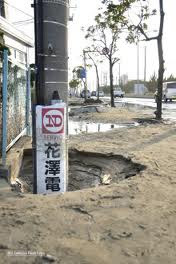 I never knew that aftershocks continue for so long after the earthquake. It is amazing to hear that you are still getting aftershocks! Look after yourself (and your family), and thanks for sharing! Terrible how one misfortune just seems to follow on another. I hope this chain reaction of disasters ends soon, and the rebuilding can begin.